I’ve been going to pulmonary rehab for about two years. It takes place at a very different kind of gym. It is a pulmonary rehab gym for people who have lung conditions and who need to be monitored (oxygen levels and heart rate) while exercising. Most of my fellow gym buddies have COPD or emphysema, and a few, like me, have pulmonary fibrosis. 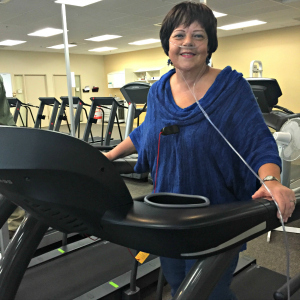 Pulmonary rehabilitation is a multidisciplinary approach to improve the quality of life of patients with chronic respiratory disorders, such as COPD, IPF, and post lung transplant. Treatment programs are individualized and tailored to the patient and includes disease education, exercise training, and psychosocial support. In addition to strength training, participants learn about oxygen therapy and their medication treatment plan. The pulmonary rehabilitation program at the Medical University of South Carolina has a devoted team of specialists to help patients improve their exercise capacity, reduce their symptoms and improve their lives. For more information please call 843-792-LUNG. Just hours before midnight May 17, light blazes along a dark hallway from one lone operating room. Inside, nurses bustle about, prepping for what’s to come. David Flurett, 57, hopes it will be him. Cuddled up against his wife who has crawled up into his hospital bed, Flurett seems oddly chipper amidst a chorusing beep of monitors. His wife, Debra, compares the wait for her husband’s double-lung transplant to having a baby. They didn’t know exactly when it would come or if tonight might be a false run. Debra Flurett cuddles up with husband David Flurett, just hours before he is scheduled to get a double lung transplant. All they know is that surgeon Chadrick E. Denlinger, M.D., is en route to pick up the donor lungs. All they can do at this point is wait. In the corner of the room is Flurett’s 42-pound backpack, custom made for the three tanks of oxygen he has to carry. He specially designed it so he could remain mobile at home and at work, where he handles fire systems’ testing and maintenance at the Savannah River Nuclear Solutions site. Rarely sick a day in his life, Flurett’s luck ran out a couple of years ago when an annual physical and X-ray revealed a spot on his lungs. When he had his next physical, it showed up again and was worse. He was referred to a pulmonologist in Aiken, and had a CT scan and breathing test. Flurett was, too, but he wasn’t as surprised by the diagnosis based on how hard it had gotten for him to breathe. On the continuum of diagnoses, Flurett got one of the worst – idiopathic pulmonary fibrosis or IPF, which is a chronic and incurable disease that causes tissues deep in the lungs to stiffen and scar. According to the Coalition for Pulmonary Fibrosis, more than 128,000 Americans suffer from IPF, with 40,000 dying from the disease each year. Flurett pulls his wife in closer to his side as they talk of that day they got the news. A tight-knit crew, he and his wife love being home together with their two dogs and two cats, piddling around in the garden and house. With surgery looming, they reminisce about how they met. Flurett’s calm demeanor cracks only once as he tears up talking of family. His son Orion is a Clemson engineer graduate bound for the Navy and his daughter Ariel, 22, loves horses and has an associate’s degree in business. His surgery a go, Flurett’s surgical team huddles around him. The clock reads 1:50 a.m., but it might as well be 8 in the morning. The air hums with energy. Flurett’s chest rests open. There’s a flash of pink as his lungs slip into view and then back out, like cycling surf that is in sync with his breath. They are lungs that in a few hours, will no longer be his. Penny Mitchum, RN, clockwise from left, assists Dr. Chadrick Denlinger as he and Dr. Jeffrey Griffin transplant the donated lungs into David Flurett. Surgeon John Kratz, M.D., and chief resident Jeffrey Griffin, M.D., prepare to remove Flurett’s lungs as they wait for news of Denlinger, who is expected to arrive shortly. The call finally comes at 2:15 a.m. that the donor lungs have arrived at the local airport, and Denlinger is en route. At 2:35 a.m., they go onto cardiopulmonary bypass, just as Denlinger and Danny Eads, M.D., roll the donor lungs down the hallway. Lifted from their sterile nest inside an ice chest, the two lungs still are attached to the donor’s trachea and part of the left atrium, the back of the donor’s heart. Denlinger quickly separates the lungs, a marbled color like speckled birds’ eggs, into respective left and right sides, and they are gently placed into sterile basins. Meanwhile, Penny Mitchum, R.N., anticipates what the surgeons need often before they ask for it as Kratz and Griffin remove the diseased lungs. Perfusionist Heidi Doffing uses her quick wit to keep the mood light, the team sharp. It’s far from her first case of the day, but she monitors all vitals diligently. Flurett’s blood flows through a maze of tubes, an artificial circulation system, an invention that’s the genius of other researchers from days past. Flurett’s heart still beats, but it’s mostly an empty beating heart now that he’s on bypass. The team talks about how much they like Flurett, what “a good guy” he is. A mood of camaraderie settles in. Denlinger switches out with Kratz, working quietly and methodically to sew in the donor lungs one at a time. Trained by the pioneers who developed the techniques for doing lung transplant, Denlinger is doing his favorite type of operation. He’s drawn to its complexity and technical challenges and the magic of that final moment that he hopes will happen soon. Penny Mitchum, RN, clockwise from left, assists Dr. Chadrick Denlinger as he and Dr. Jeffrey Griffin are about to transplant the donated lungs into David Flurett as perfusionist Heidi Doffing monitors his vitals. The bypass pump circulates approximately five liters of blood each minute, essentially replacing the normal function of both the heart and the lungs. After both lungs are completely sewn in, it is time for the moment of truth. The lungs turn from a pale ashen white, from being on ice, to a flushed pink. Dr. George Guldan, M.D., the anesthesiologist, gently reinflates the lungs with the ventilator and the flow through the bypass pump is cut in half. After ensuring that there are no bleeding issues the bypass pump is turned off completely. At 6:17 a.m. May 18, Flurett pulls in his first breaths with his new lungs. The room quiets as the entire surgical team stands captivated by the monitors. They watch the oxygen level hold steady at 100 percent and celebrate that his vital signs remain stable. “The lungs turn pink and look alive and that’s awesome,” Denlinger comments. “The true test of the operation is once we wean off the cardiopulmonary bypass. The best part of the operation is when we turn down the (bypass) pump and prove that the lungs are capable of doing what they are supposed to be doing – they are oxygenating the body. That’s success. That’s really what I look forward to in the entire case. It’s like touchdown for the space shuttle. Flurett specially designed a backpack to carry his oxygen tanks so he could remain mobile at work. That’s not to say he’s not grateful for being off oxygen, constantly tethered to a cord. It’s a problem she’s grateful to have. There are challenges that come with transplants, such as the immune suppressant medications necessary to give the new lungs a chance to work. Life expectancy rates also are lower than for other transplants. The median survival for double-lung recipients is 5.5 years. Debra said she’s grateful for their second chance at a better quality of life. Flurett said he feels “tremendously better” and is grateful he no longer is attached to oxygen by long hoses that his wife accidently kept stepping on, trying to choke him. Debra rolls her eyes at the running joke. His wife agrees. “You get the sense that they know each other very well, and they know us well. And they told us that. They said ‘we will know a lot about you and your family. You will become a part of us when you get this transplant,’ and she was absolutely right,” she said of Flounders, who is the lung transplant coordinator. MUSC respiratory therapist, Jessica Gregorie shares a laugh with David Flurett while he rides a stationary bike during his physical therapy session at MUSC.